DeDe Westbrook was one of the NCAA’s most explosive playmakers in 2016. His last year at Oklahoma was nothing short of breathtaking. The receiver put up 80 receptions for 1,524 yards and 17 TDs. 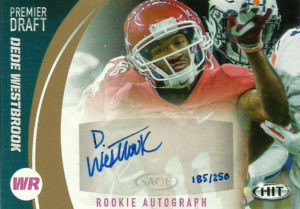 He is also a dangerous punt returner taking one to the house as well. In fact, he finished 4th in Heisman voting last season. So it’s a wonder up to this point why he was selected in the 4th round of the 2017 draft by the Jacksonville Jaguars. Let Westbrook’s situation be a lesson to any aspiring football player. I think he’d also say that too. In 2012 and 2013 he was arrested on charges of domestic violence towards the mother of his child. Both charges were dropped. Then later ‘anonymous’ scouts burned him over Twitter. Later again, it was rumored that Westbrook was kicked out of a 15 minute combine interview. His draft stock obviously took a large hit, and to think of it, if this was 2015 he might not have even been drafted with the way the NFL was taking a hard look at players of questionable character- ‘but it is the way it is’. Westbrook is well aware that he will be on a short leash in Jacksonville and he’s humbled by their selection. Taywan Taylor played for the Hilltoppers of EKU. Because of his ‘small school’ status- opponents and scouts have severely underrated Taywan’s talent. He’s just done about everything to prove them wrong catching 9 passes for 121 yards against the NFL grade Alabama secondary. With supersized paws and the speed to match, he led the FCS in 2016 in yards on deep passes with 948. NFL scouts have pegged Taylor in as a slot receiver. I myself- was hoping the Texans would snag him. I thought his combination of speed and size in the slot would be perfect for the team, reminding me of TY Hilton, (another prospect I had hoped the Texans would select, but ended up on the Colts instead). True to sad form, Taywan was not selected by the Texans, but rather by division rival Tennessee. The Titans took Taylor with the 8th pick of the 3rd round of the 2017 draft. A really solid card here by Sage with a good action shot combined with clear photography and nice framing. 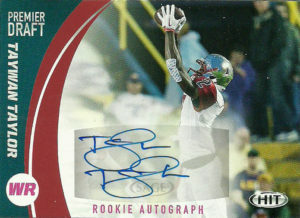 It also helps that Taywan has a really solid autograph- something that I can appreciate. I tweeted to Taylor about his card and that he was a sleeper in the upcoming draft which caught his attention enough that he retweeted it. 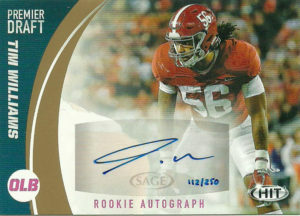 Tim Williams played at Alabama where he was a beast. With unrivaled speed around the edge and an impressive first step, he started in both 2015 and 2016, posting impressive attack lines: 11.5 TFL and 9.5 sacks (2015), and 16 TFL and 9 sacks (2016). The knock on Williams is that he played in a rotation and where he was relatively unproven as a zone or pass defender. Tim has however demonstrated that he is an excellent edge rusher, especially in a 3-4 alignment. Tim was selected with the 14th pick of the 3rd round by the Ravens in the 2017 draft. A great value here for the Ravens, as Williams will be relied on early to come in and contribute as a situational pass rusher in their 3-4 defense.